OFTEN a beautiful house renovation is completed without a great deal of thought to the garden or, if a home boasts lovely grounds, it is at the expense of work done to the house. 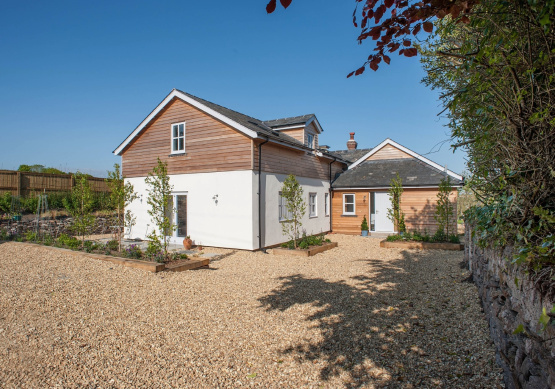 But in the case of The Coach House, in the popular creekside village of Newton Ferrers, the whole property has been stylishly transformed. It probably helps that The Coach House is owned by the innovative garden designer Sam Westcott and her husband Tony but her creative talents are as evident in the way they have completely remodelled and extended the old stone cottage as they are in the way she has cleverly crafted the outside to enhance both the building and its stunning rural views. Both originally from Devon the couple have had countless house moves over the years but when they discovered the charms of Newton Ferrers, with its attractive scenery and thriving community spirit, decided they wanted to create a 'forever home' for themselves and their young twin boys. Family reasons, however, mean they are now on the move again so it means that someone else will inherit the thoughtful attention to detail that has changed this property into a light and airy family home which blends so perfectly with its setting. Originally the coach house on the historic Puslinch estate, the single storey cottage they took over was once the home of the horses, coach and coachman. It was, to use Sam's words, a “higgledy piggledy, quite dark” property and as well as exposing natural stone walls they also found lots of old bits of tack. They also uncovered the most amazing view which had been completely hidden behind a mass of overgrown trees but which has now become the focal point of a home which is flooded with natural light through clever placement of windows and roof lights. Approached over a gravel driveway the front of the property is clad in cedar and has a very contemporary appearance but from the rear the stone gives it a more traditional rural feel with French influences. The spacious kitchen diner, well equipped with a range of country-style timber units painted in subtle Farrow and Ball pastels which are echoed in the neutral décor of the rest of the house, has a range cooker and French doors perfectly frame the view of the picturesque valley beyond. The same view is also captured in the bright, spacious sitting room with its wood panelling and wood-burning stove. A beautifully lit staircase rises to the extra storey added to the property where there are two double bedrooms, one en suite and another with a walk-in wardrobe and the well appointed main bathroom and there are two further spacious double bedrooms at ground floor level together with another bathroom. Carefully chosen plants and shrubs fill both the raised planters at the front of the house as well as the borders at the rear where there is also a wild flower meadow and a large studio with power, light and high speed internet access. The gardens attract a wealth of wildlife and have been designed to provide colour and interest throughout the seasons but with the minimum of maintenance. Strategically placed patios capture the sun at both the beginning and end of the day. The Coach House is on the market with Marchand Petit’s Prime Waterfront & Country House Department (01548 855590) and the Newton Ferrers (01752 873311) branch with a guide price of £725,000.